The Chocolate Fountain uses a Heater Plate to keep chocolate warm and flowing, just like hot liquid chocolate candy. Chocolate Fountains are used for many events such as Wedding Receptions, Parties and Birthday Parties. 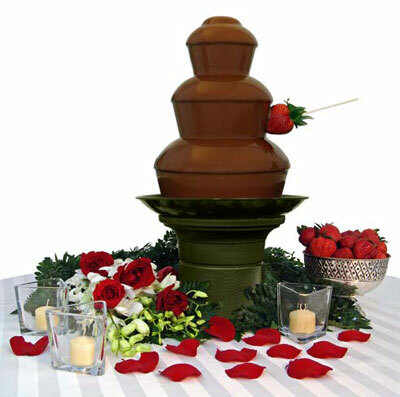 A chocolate fountain is a device for serving chocolate fondue. Typical examples resemble a stepped cone, standing 2-4 feet tall with a crown at the top and stacked tiers over a basin at the bottom. The basin is heated to keep the chocolate in a liquid state so it can be pulled into a center cylinder then vertically transported to the top of the fountain by a corkscrew auger. From there it flows over the tiers creating a chocolate "waterfall" in which food items like strawberries or marshmallows can be dipped. Melted chocolate is very temperamental, so rich couverture chocolate, which is high in cocoa butter, is commonly used to ensure consistent flow. If the cocoa butter content of the chocolate is too low, an additive must be mixed in to decrease viscosity. (Vegetable oil is most commonly used to do this.) But even couverture chocolate--unless specifically designed for fountains--often still requires an additive to make it flow smoothly. Because of this, it is highly recommended that chocolate formulated specifically for fountains be used to avoid the need for the addition of vegetable oil, as the oil gives a slimy, gritty taste and texture to the chocolate. Few chocolate fountains are capable of melting chocolate directly in the basin, so chocolate is typically melted in a microwave or double boiler before pouring it into the chocolate fountain. A cheaper alternative to couverture chocolate is chocolate-flavored syrup, also called "chocolate coating". Chocolate coating is already in liquid form and costs much less than couverture chocolate- although many would argue that the extra expense of gourmet Belgian couverture chocolate is more than worth it. Fundue Foods has created a unique chocolate fountain for at-home entertainment, also good for parties, receptions and weddings. This Chocolate fountain allowing rich, mouthwatering warm chocolate fondue to gloriously surround an endless assortment of treats and delicacies with a simple flip of the switch! Just like liquid chocolate candy. The Chocolate Fundue Fountain is the home entertainer?s version of the large chocolate fondue fountain found at large events and weddings, but offers the ease of use and clean up expected from a top quality home appliance. The Chocolate Fundue Fountain offers easy set-up, remarkably quiet operation, quick clean-up with dishwasher safe parts, and is UL listed.